Seriously, I never thought I would write about magic cards again. This week on PopMatters I praise Wizards of the Coast's willingness to support a casual format that looks to be salvaging the game for me. Of course the real credit goes to Magic players who pioneered the format and experimented with the game. I've always been a fan of home-brew adaptations of games, and apparently so has Wizards of the Coast for quite some time. The number of casual formats is not surprising considering how long the card game has been around. While I certainly have my own house rules for certain games, I would love to see more casual experimentation with game design in tabletop gaming. Magic's depth certainly lends itself well to manipulation, especially around certain themes. Tribal Wars format, for example, which asks players to create decks around specific creature types, is only possible when you have such a robust catalog of cards to choose from. My Netrunner collection has grown pretty large. Maybe not is the time to experiment with running my own Netrunner variants. To some extent, designers are doing these thematic tweaks themselves. I recently played Legendary's Aliens tabletop game, which takes its mechanics largely from the Marvel deck building game of the same name. The change in theme is expertly done and adds some neat mechanics (such as scanning rooms) perfectly into its deck building core. In fact, both Aliens and Marvel can be combined into one hilarious mesh between the Marvel and Aliens universe. I for one welcome our hybrid overlords. I have not! I feel the rabbit hole widening. 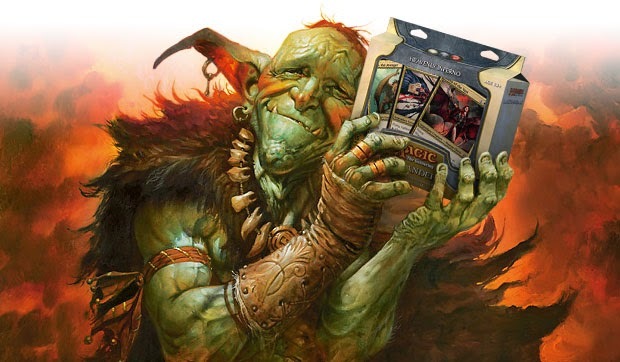 I've already started looking into MtG podcasts and buying single cards I want for m commander decks... this won't end well.